The keys we use every day are small metal objects with little grooves on them. Accustomed as we are to their use, it's hard to imagine something less tropeworthy than a humble key. Yet consider the symbolism of this tiny object—it opens that which is closed, changes barriers into passageways (or vice versa). A key in the wrong hands can be disastrous. And possession of a key can be a sign of authority and responsibility, from a housewife's key ring that indicated she alone could disburse food and drink to a lord's master key giving him the run of his domain. A Cool Key is one that is intended to reflect these values. It may simply be ornate and fancy, or it may have some special attributes that are unusual, most commonly the power to Open and Shut. The most common type is the Skeleton Key, which in addition to just being cool, is associated with the ability to open any lock for historical reasons: skeleton keys were used in antiquity to pass warded locks, which is why warded locks aren't very popular anymore. There are also master keys, which are designed to open any lock in a given set, allowing its possessor unlimited access to the household or area associated with the locks. A Cool Key typically goes hand in hand (so to speak) with an equally elaborate lock or possibly a Cool Gate. In speculative settings, the key to a particular mechanism may not resemble a normal key at all, or not even be a traditional key, but a particular word or phrase to be spoken or even a person. Sailor Pluto, guardian of the time gate in Sailor Moon, uses a giant key as her weapon. It's so big that when she stands on a floor with it, it reaches her neck. In Bobobo-bo Bo-bobo, Hatenko uses the Fist Of Keys as a weapon to lock his opponents up. In Tengen Toppa Gurren Lagann, Simon's Core Drill not only activates his mini-mech, it also functions as a drill, albeit a very small one. He uses it to drill through Lordgenome at the end of the first Story Arc. In the Compilation Movie he also uses it to escape from a prison and climb a mech that is holding Nia hostage. Celestial Spirit Magic in Fairy Tail requires keys to open celestial spirit gates, which are basically gateways into their dimension. The manga originally gave these keys fairly plain designs until the anime decorated them more intricately. Shortly after, the manga followed suit. The key to Superman's Fortress of Solitude is a huge thing ◊ that only he can lift; it's also used as an aircraft path marker. In All-Star Superman, he replaces it with a small but super-dense key that supposedly weighs half a million tonnes. Whether or not he's exaggerating, only someone with his abilities can lift it. The Key to Hell that Lucifer passes to Dream of the Endless in Neil Gaiman's Sandman. The Magical Keys (seen above) from Locke & Key. The Justice League of America villain called The Key uses key-shaped gadgets. In ElfQuest, the key to Two-Edge's treasure vault is hidden in the pommel of Cutter's sword, New Moon. The white key that the four retrieve from the cliff dwellinga seven-foot glowing staff. The Nine-part Key that someone has to assemble in order to get into the Black Tower. The Keysyou'll learn about them in Keys: The Hard World. The ultimate in Cool Keys. In Coraline, the key to opening the door to the other world has a button-shaped bow. The Keymaker in The Matrix Reloaded could make keys to open any door or lock in the Matrix, or keys to make any door go to a particular destination. The key to the elements chamber in The Fifth Element doesn't look all that fancy, but is distinctive in having four wings instead of one and fitting between the door panels themselves. The blue key in Mulholland Dr.. In Garth Nix's Keys to the Kingdom books, there are seven keys, each signifying control over a part of the The House, and which each do different things (such as being able to transform into weapons or gloves). In Neverwhere, the key kept by the Black Friars is the main Plot Device. It is the key to a gate to heaven as well as "to all reality", as the abbot says. The full limitations of this are not explained. James Butler Hickok Stark, aka Sandman Slim stole the key to The Room of Thirteen Doors, which is the only way to Earth from Hell (unless you're Lucifer himself). We don't know what the key looks like as Stark buried it in his body, but he doesn't need to actually fit it into a lock for it to work, either. In Harry Potter and the Philosopher's Stone, the key to get through one of the obstacles guarding said stone has wings and tries to escape from anyone who comes near. It's made even more difficult to catch by filling the room with hundreds of other flying keys, all of which would be pretty cool if they actually opened anything. The enchanted key crafted by Christina of Milan in Sixty Eight Rooms, that allows any woman who touches it to shrink. In Smallville, the key to Kal-El's space ship is a metallic octagonal disc. You heard me. The keys to unlock a very deadly artifact guarded by a powerful secret society... has only one tooth. Try using a lock pick next time, Lex. The Key (note capitalisation) in The Lost Room has the ability to make any door (within certain specifications) lead into the Room, which has powers of its own. It's one of the most desired Objects in the show. The keys to the TARDIS look perfectly ordinary, but are given to companions as a sign that they've been fully accepted by the Doctor. More in line with the trope, they've been shown to glow when the TARDIS is active, and been retrofitted to make people ignore the person wearing them. 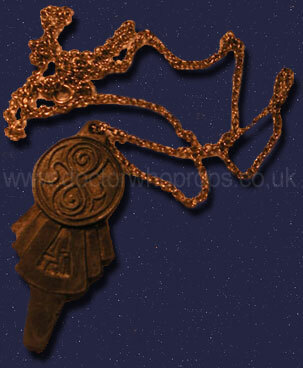 The TARDIS key may look ordinary now (and in The '60s), but back in The '70s it looked like this ◊, and in The '80s like this ◊. Part of the coolness factor is the fact that it looks like a normal everyday key. You expect a device that allows you into the ship that can take you anywhere and anywhen and is bigger on the inside to be fancy and alienesque and Star Trekkian. That it's oh-so-innocuous is awesome. 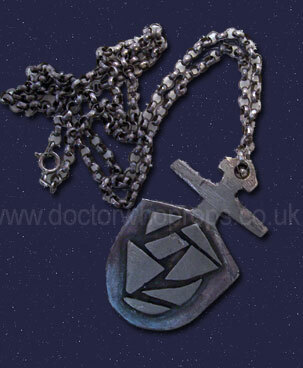 Doctor Who also had the Key to Time, which when assembled looked like a metal cube. The sonic screwdriver also often acts like a skeleton key. The Osterhagen Key is considered quite cool just because of what it does. In season 5 of Buffy the Vampire Slayer, a mystical key to alternate dimensions is transformed into human form, and the timeline is altered to place her into reality as Buffy's younger sister, Dawn. Kamen Rider Drive: Two of them, both based on car keys. The Tridoron Key, featured in the Surprise Future movie, allows the user to control Tridoron and collects data from Kamen Rider Drive. Shinnosuke used it in the Mach Driver Honoh to transform into Super Deadheat Drive, but soon figured out that it was actually serving as a backup for Krim's consciousness and, with the help of the Type Change Shift Cars, used it to restore Krim's AI into the future Drive Driver at the cost of the Key's existence. The Tokujo-ka Key (lit. "Special Investigation Unit Key") is designed after the Tridoron Key and, if used in the Mach Driver Production Model, transforms the user into the production model of Kamen Rider Mach. However, technical difficulties in the suit prevented it from being mass-produced, and the remaining Roidmudes were all dealt with before it could be perfected, making it redundant. Chouriki Sentai Ohranger / Power Rangers Zeo: Gunmazin spends most of his time in a small tiki form, which can only be unlocked via inserting a special golden key into its forehead and reciting a spell. His Zeo counterpart, Auric the Conquerer, requires only the key and no spell. Gekisou Sentai Carranger / Power Rangers Turbo: The Rangers in both series transform via inserting keys (Accel Keys and Turbo Keys, respectively) into their ignition/gearshift themed Transformation Trinkets (Accel Changers and Turbo Morphers); the Turbo Keys are based on Lerigot's Golden Key (which, despite its name, looks more like a wand). Carrying the car theme forwards, the keys would also be used in the formation of the first Humongous Mecha they used (insert the keys, hit the brake pedals, robot stands up via gravity). Power Rangers Lightspeed Rescue: The demons possessed a Golden Key that could unlock a door to the Shadow World (their afterlife) and back; it also unlocked a coffin-like tomb that would have allowed all the deceased monsters to escape, had the Rangers not stopped them. Bakuryuu Sentai Abaranger / Power Rangers Dino Thunder: AbareBlack transforms by inserting the Dino Harp, which turns into a key-like form, into his Dino Commander; the same holds for its Dino Thunder counterpart, the Brachio Morpher. Kaizoku Sentai Gokaiger / Power Rangers Megaforce: The Gokaigers have keys based on their many, many predecessors, allowing them to mimic their powers (basically, keys are to Gokaiger what cards are to Kamen Rider Decade). The Mega Rangers used their own versions. Both series also had a special Gold Anchor Key that, inserted into the bottom, activated the Silver Rangers' Gold Mode. Power Rangers: Beast Morphers: Unlike its Sentai counterpart (the Morphin Brace), the Beast-X Morpher is activated by the insertion of a Morph-X Key. Custodian: Here it is. It's this fat little devil with the blue ribbon on it. Jesus in the the gospel of Matthew tells Simon Peter, the apostle who is blessed for his declaration of Jesus being the Christ, the Son of the living God, that He will give him "the keys to the Kingdom of Heaven", that with them, whatever he "binds" on earth will be (or will already have been) "bound in heaven" and whatever he "looses" on earth will be (or will already have been) "loosed in heaven". This is usually interpreted by Catholics as Peter having the authority to determine who will enter the Kingdom of Heaven and who won't upon Judgment Day. Jesus in the Book of Revelation tells John the apostle that He holds the keys to Death and Hell (Hades in the Greek). Dungeons & Dragons had at least 20 standard types of magical keys, each with its own powers. Adventure X2 Castle Amber: The Cool Gate "The Gate of the Silver Keys" can be opened only by three silver keys found at various places in the Castle. In Adventure C2 The Ghost Tower of Inverness, to enter the title tower, the Player Characters must find and assemble a four-part key. The "Skeleton Key" is a character template in Big Eyes, Small Mouth third edition; they have the power to open the portals between worlds. Invisible Sun has wicked keys, which vislae can use to unlock any barrier in their way; these keys are not just limited to doors and gates, as they can even be used on people. On rare occasions they can be found during a keystorm, but more often than not they must be earned by characters. BIONICLE: the Keystone, which is made of many components each containing instructions on how to awaken Mata Nui. Once all piece were retrieved, it was used to deactivate the barrier surrounding the Codrex. As a bonus, its united form was a miniature Mata Nui sculpture. The Yatagarasu's Key in Ace Attorney Investigations. Not only is it very ornately designed, it also has a built-in knife blade! And the blade is also a key. Nethack: Rogues eventually get the Master Key of Thievery, an artifact that reduces physical damage by half and lets you control where you land after being teleported, in addition to being able to open any lock with 100% success. SLASH'EM adds three additional artifact keys (one for each alignment) that, while easier to get, only offer the 100% success on lock opening. The Keyblades of Kingdom Hearts combine this with Cool Sword. Giant magical key-swords that allow you to travel between worlds and dimensions, open any lock and, as of the latest games, shape-shift into anything from a hovercraft to a cannon. They don't get much cooler than that. Zelda's Boss Keys or Big Keys usually have horns on the back, or horns as the teeth of the key. The Cel Shading games added an eye on the back of the key. The Legend of Zelda: Twilight Princess' Boss Key ◊ has a more crystalline shape. The Legend of Zelda: Skyward Sword's Boss Keys are 3-dimensional golden sculptures that have to be turned the right way before inserting them. Their shape is also thematically related to the dungeon they are found in; the one in the Ancient Cistern resembles the dungeon's central Buddha-like statue, while the Sand Ship's resembles a squid. In the NES games, Link can collect the Magical Key, an imposing lion-faced key in gold that can open infinite doors. Taking its cue from the Zelda series, Distorted Travesty 3 has a big fancy key which even gets a short, rather strange cut-scene when used. Darksiders has a Beholder's Key that is basically a dagger. This is used to unlock "doors", which are actually forcefields with an eye in the middle. War takes the key and stabs it in the eye, lowering the force field. Wario Land 4: Keyzer, a ghost with a key for a nose. A.B.A. of Guilty Gear uses a giant key that is also an axe as a weapon. Its name is Paracelsus, and it has googly eyes and a stitched-up mouth, and is larger than A.B.A. herself. Guilty Gear is that kind of game. In Arena, the Skeleton Key will open any non-magical locked door or chest once per day. In Daggerfall, the Skeleton Key functions similarly to Arena but can now open magical locks and can be worn as an amulet for a stat boost. In Morrowind, the Skeleton Key is a lockpick which will never fail. It only has 50 uses, however, and does not disarm trapped locks. In Oblivion, the Skeleton Key is an unbreakable lockpick that greatly increases your lockpick skill; this allows players to simply press the button to automatically make an attempt over and over until the lock opens, allowing for any pickable locks to be bypassed entirely. In Skyrim, the Skeleton Key has the power to open anything from doors to abstract things like hidden potential inside a person. Unfortunately, in the hands of th eplayer, all the Key does is function as an unbreakable lockpick (which is pretty handy), but you only get the key for a little while unless you decide to not complete the quest to turn it in. Dark Souls II has the Key to the Embedded. Though it only opens one door in the game, it also doubles as a greatsword. The Pokémon Klefki is at least related to this trope. It's a sentient key ring that also looks like a key itself, and which steals keys from people to wear. The translucent blue Crystal Key in the video game of the same name. It's used to interface with portal devices made by the Arkonians, and each plane added to it, which you'll eventually collect, contains coordinates for the various colony worlds within the game. The Lost Key of the Red Pyramid of Bishara from Girl Genius is an elaborate giant key. In Red vs. Blue, Tucker's sword, a legendary binding artifact, has the second function of being the key to the hangar of a cool spaceship. Church: So it's a sword. It just happens to function like a key in very specific situations. Caboose: Or it's a key all the time, and when you stick it in people, it unlocks their death. In the Global Guardians PBEM Universe, the villainous Locksmith had a large, elaborate, and rather baroque-looking key that he uses to open any lock, and create "doorways"... dimensional tunnels from one location to another... by way of opening random door. When the heroes captured this "dimensional key", they discovered it was just a prop, and it was the man who had the power all along. The Lock Legion has the Key of Glorton. In Problem Sleuth, keys are sometimes weapons. The key is a pistol, the ring of keys is a machine gun, and the Megaton Key (a particularly cool key in its own right) is a set of brass knuckles. The SCP Foundation has SCP-005 , a key that can open any lock in the world, provided the user can find and identify the lock. There's also SCP-860 , which when used inside of coordinates which appear randomly on the key's blade to open a door, will cause the door to open to a mysterious forest clearing dubbed SCP-860-1. The key has also been shown to be able to dematerialize in one place and appear in another. In the Adventure Time episode "The Enchiridion", the key to opening the gates to get the MacGuffin is literally the Gate Keeper, whose hat looks (and functions) just like a giant key. Avatar: The Last Airbender: The Air and Fire temples are both locked with mechanisms which can only opened by the appropriate bending discipline being used on the doors. Early on in Detentionaire, Lee is given an octagonal key with retractable spikes. The spikes are what open things, as the locks the key is meant to open are also octagonal and have holes to the spikes to grab. The key opens several doors throughout the underground passageways beneath the school, and Season 3 reveals that it's one of two identical keys that are meant to be used to open the mysterious pyramid, also located under the school. The Arthur episode "Finders Key-pers" revolves around this trope in a sense. Arthur, Brain and Binky find a key, and spend much of the episode thinking of all of the cool things that it might unlock, such as an F1 race car or a literal key to the city. In the end, the key is revealed to actually just go to the sprinklers for the school's baseball field. The Keys of Harmony from the 4th season of My Little Pony: Friendship Is Magic. The episode "500 Keys" is about finding a collection of keys to every imaginable lock in Springfield, which leads to Lisa finding a hidden room (and its dark secret) at the elementary school Bart (quite accidentally) being awarded the symbolic key to the city, and Marge's adventure with a silly wind-up toy (which is actually Homer's anniversary present to her). Homer is awarded the key to the city in an earlier episode, but is forced to return it. He admits trying to eat it, believing it to be chocolate wrapped in tinfoil. In "Simpson and Delilah", the Springfield nuclear power plant has a highly coveted key to the executive washroom (just saying it's a fancy bathroom wouldn't do it justice). It's awarded to only the highest executives in the plant's hierarchy and it's so legendary that someone can just say "the key" and everyone will know what they're talking about. Homer briefly has access to it after a promotion. In "This Little Wiggy", Chief Wiggum has a master key that works on every single lock in Springfield. From local shops to an abandoned prison. Bart and Ralph steal it from Wiggum and mischief ensues. In the Ed, Edd n Eddy episode "Key to My Ed", the Eds find a mysterious key and spend the entire episode trying to find out what it is. Eddy thinks it to something really expensive like a treasure chest or a vault while Edd just wants to return it to its owner. In the end they find out it's just Ed's house key that he lost. The occupational badge (optionally) worn by US Air Force personnel in Intel career fields is a key superimposed over a globe. The Key to the City, an award occasionally bestowed on folks who do particularly good things for a city (such as being the Big Damn Heroes), is a tradition hearkening back to the days when cities were protected by walls with gates that they would lock at night to keep outsiders out. If you had a key to the city, you could come and go as you pleased. In 19th C. household, when a man brought his new bride home there was a little ceremony in which his mother, unmarried sister, grown-up daughter, or whoever had been mistress of the household, handed over the keys to the house to the new wife. Key Guns , which are exactly what they sound like. Supposedly intended for use by prison guards, enabling them to quell a rowdy prisoner without opening the door by firing through the lock, most were probably not functional as keys and were probably intended as a disguised holdout firearm or just a gimmicky conversation piece. The Keys of St Peter, the symbol of the Pope's authority. Each pope gets a set of actual keys, which is destroyed upon his death.